Classifies cases into groups or predicts values of a target variable based on values of predictor variables. Enables you to predict or classify future observations based on a set of decision rules. Includes validation tools for exploratory classification analysis. You can also view nodes using one of several methods: show bar charts of target variables or tables, or both, in each node. Includes evaluation graphs to enable visual representation of gains summary tables. Provides a gains chart to identify segments by highest (and lowest) contribution. Lets you export objects to any SPSS Statistics output format. Generate rules that define selected segments in SQL to score databases or define syntax to score SPSS Statistics files. A fast, statistical multi-way tree algorithm that explores data quickly and builds segments and profiles with respect to the desired outcome. A modification of the CHAID algorithm that examines all possible splits for each predictor (independent) variable. A comprehensive binary tree algorithm that partitions data and produces accurate homogeneous subsets. A statistical algorithm that selects variables without bias and builds more accurate binary trees quickly and efficiently. 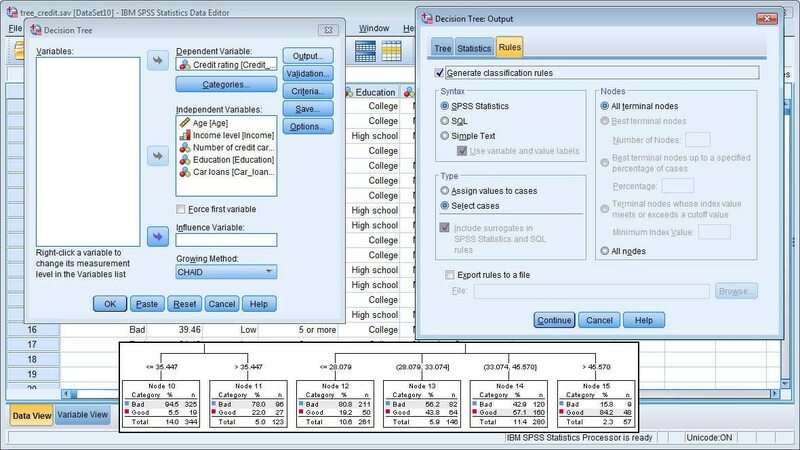 IBM SPSS Decision Trees requires a valid IBM SPSS Statistics Base license.